Easy green bean casserole is a Thanksgiving tradition and a huge family favorite. Making green bean casserole is simple with this one-pot recipe. It’s easy being green and damn delicious. According to Wikipedia “Green bean casserole is a casserole consisting of green beans, cream of mushroom soup, and french fried onions. It is a popular Thanksgiving side dish in the United States, created in 1955 by Campbell’s”. However, that seems really boring. Green bean casserole can be so much more than that. Those ingredients, for one thing, are boring as hell. Why not add some mushrooms, onions, cheese, bacon or other pre-cooked meat. Green bean casserole doesn’t have to be boring. See the bottom of this post for some ingredient ideas on how to spruce up your casserole. Some of the ingredients in green bean casserole. Mom always made green bean casserole with frozen or canned green beans. Considering this vegetable is going into a casserole, this does save a lot of time. Especially when you are preparing a ton of dishes for a holiday meal. While canned and frozen are easy, fresh is best. To prepare the green beans, wash them and then clip off the ends. If the green beans are long, you can cut them into a more uniform size. Saute the green beans for about 3 to 5 minutes before adding to the casserole. If you are adding fresh mushrooms, saute those with the green beans. Fresh green beans are best, but canned and frozen are easiest. If making ahead for a holiday you can prepare the casserole ahead of time and store it in the refrigerator for up to 3 days. While the oven is heating up you can add the french fried onions. You can do the same if making ahead to take on a campout. Prep the casserole in a Dutch oven liner, over tightly keep in the color until ready to bake. 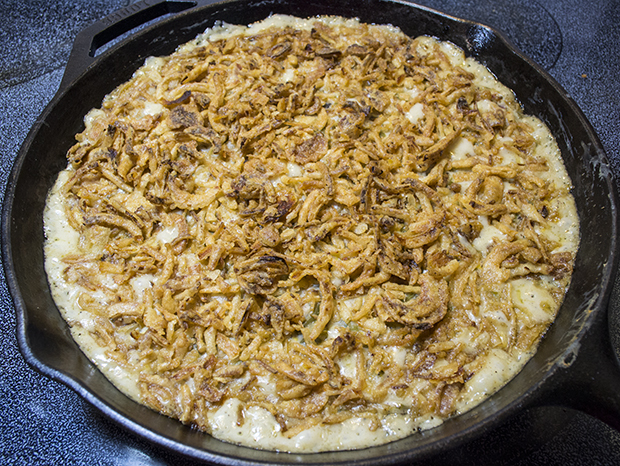 While the coals are preparing, place the liner in a Dutch oven and add the french fried onions. Bake at the same temperature and time you would as in an oven. Consult the Dutch oven coal chart for more information on how many coals you will need to attain the correct temperature. Making delicious homemade bacon bits adds a lot to any dish. If you want to make green bean casserole without onions but still want that crunch casserole topping on your green bean casserole, the simply substitute bread crumbs for the onions. Putting together a green bean casserole is super easy. A general rule of thumb for leftovers without meat is three to five days. If you add meat like bacon it should be fine for that long as well. Bacon is processed. Something like fresh chicken should probably only be kept for up to three days. Do not, I repeat, do not freeze green bean casserole, the beans will not hold out well and it will lose any crispiness from the onions. Mixing all the ingredients together for green bean casserole. I recommend using a Dutch oven to make green bean casserole over a campfire. Refer to the Dutch oven coal chart on this website to find out how many coals to use. I love cooking casseroles over a campfire because it means using a Dutch oven which is a lot of fun. No room in your oven this holiday? Why not cook the green bean casserole in a cast iron dish out on the grill or over a campfire. A good outdoor Dutch oven will make it easy and fun and keep your hubby busy so he’s not messing with your turkey. Green bean casserole cooked in a cast iron skillet. Topping off the dish with French fried onions. This recipe shows you how to make green bean casserole from scratch. Honestly, I know no other way to enjoy this great holiday dish. 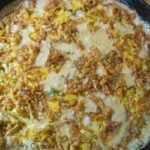 Green bean casserole is a delicious holiday treat but can be made anytime. This simple side dish is all dolled up for our dinner. Chop up 1/2 cup of bacon and sauté in a Dutch oven or cast iron skillet until just done. Add mushrooms and green beans and cook until green beans are nearly done. Add the mushroom soup and milk and stir in for 2 to 3 minutes. When the green beans are fully cooked, add 1 cup of the French fried onions and 1 cup of cheese and stir in the mixture. Place lid on Dutch oven and place about 15 coals on the top for about 10 minutes or until the French fried onions are just turning brown. If you are using a skillet you can toss a lid on it and place coals on top for about 5 minutes or until brown. If you have an oven you can just place it in an oven for 20 minutes at 375 or until top is golden brown. This recipe was originally posted on October 27, 2014. It has been updated and reposted here for your enjoyment. We hope you enjoy this recipe and use it many times. Nothing is better then having a nice hearty dish while out camping. Make this delicious meal with friends and family and you will be sure to have great memories. Great memories indeed! Thanks for checking it out.